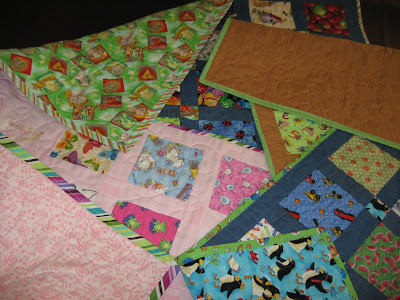 Hooked on Needles: I Spy Quilts ~ Finally Finished! Whew! I'm happy to announce that all my little I Spy quilts are finally complete! They have even been washed and have that cozy, scrunchy, quilty thing going on now! I'm quite happy with the way each of these quilts turned out too. Wanna see? The blocks used in these quilts were from the I Spy block swap that Karen organized back in 2009. I received 120 different five inch blocks and originally thought I would make one quilt using all of them. But then I discovered I could divide them up into sets to make five different baby size quilts, so that's what I did. I made the first one, a boy's I Spy baby quilt, from beginning to end all by itself, but these four I made in assembly line fashion. Here you can see the backings and bindings of all four quilts...such fun fabrics! These quilts were also some of my first long arm projects and I had such fun looping and meandering on that big machine. So one more thing I can check off my list of projects to finish, and more yardage from my stash used up on useful items. Whew! I'll be posting these in my Etsy shop soon, but if you're interested in one or more of them, feel free to contact me. My email is over there on my sidebar. They will be listed at $30 each. We're in the middle of a gigantic snow storm right now, so I'm heading down to my sewing room to finish putting the borders on a quilt top before I put a chicken in the oven for dinner. Then the whole family will be suiting up in our winter garb to spend some quality time with our snow shovels clearing the driveway, deck and walkways. Oh what fun! What an undertaking! That's a lot of quilting. They are so sweet - those blankets are going to really warm some sweet babies up! 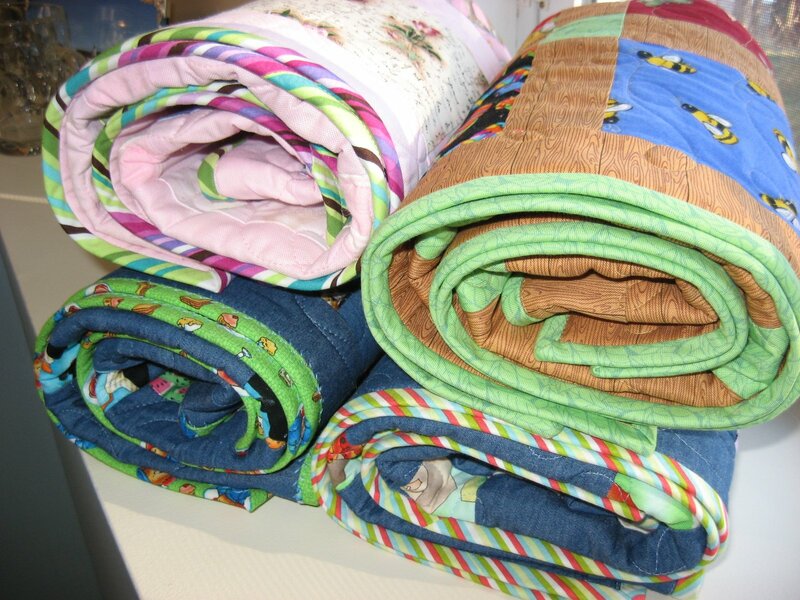 Love your quilts - nothing beats a warm, cuddly quilt! I do not miss the snow one bit. We are actually having cold weather here in the south but no snow. They're so cute and I love them all rolled up together. Stay warm and happy sewing.